Sunlight was originally part of a 2-book anthology titled Sunlight Moonlight. The two books have been republished as stand-alone books. Moonlight is available now. Sunlight will be available soon. ROMANTIC TIMES said: With Sunlight Moonlight readers are treated to two highly entertaining fantasy tales for the price of one. HARRIET KLAUSER said: Both tales are great and would be worth the price even if they were sold as separate novels. Hopefully, this will start a trend to provide the reading public more for their dollar and earn Ms. Ashley even greater fame. This is a riveting paranormal romance that keeps readers on the edge of their seat. Drawn to an old abandoned house, Lainey finds a good-looking stranger that calls to her heart. Sweeter than any man she’s ever known, she quickly falls for him , only to discover that he’s an alien from Xanthia and there are men who want to kidnap and study him. The steady to fast-paced plot is full of tension building suspense as it seems that the universe is against these two. Not only do the human s who want to experiment on him, there’s also the fact that his people try to keep them apart also which adds some spice and intrigue to the story. The author brings the story to life with vivid descriptions of the setting and events that capture the imagination. The characters are strong and compelling, easily related to and grab the reader’s attention from the very beginning. The attraction between Lainey and Micah radiates heat from every page and the sweet romance is a sensual delight as they fight for their love and happiness. The author conveys their emotions and personalities with vibrant intensity that makes the reader feel as if they really know the characters and get caught up in their story. While the beginning of the story seemed a little slow, it quickly picks up and I really enjoyed this heartwarming and sweet romance. The author added a few surprises that I didn’t see coming and I loved how the characters overcame their enemies and achieved their happily ever after. 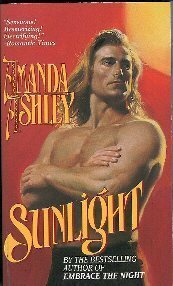 NOSE IN A BOOK BLOG said: SUNLIGHT ~ This was definitely one of Amanda Ashley's more creative books. The plot was unique and it really kept me interested. Though the beginning, several parts in the middle, and the end were very fun to read; it was the few parts in the middle that slowed it a little for me. It's not that the writing was lacking; it was simply that the characters fell into a very typical routine. This should not be a deterrent by any means. The writing was great and the plot was so interesting. Its twists and turns were excellent and made me want to keep reading. MOONLIGHT ~ Thus far, this has to be my favorite story by this author yet. Navarre was so well-written. I pretty much ate this story up. Ashley created such an interesting world with her ancient religious cult and the unexpected turns in the plot made me fall in love with the story. I really enjoy it when an author transports me with her writing and Ashley definitely did this in the first half of this story. Though the "modern day" portion of the story didn't make me fall in love as the first part did, it was no less entertaining and I really did like this story. Amanda Ashley takes readers to another world with this fantasy romance. This story was originally published in 1997 so a few details when I was reading through me off but didn’t really stop the flow completely. My favorite part in this story was the fantastic relationship Lainey had with her parents. There was this deep and affectionate bond that shone through in all of their interactions and I loved how it also affected Micah when he was witness to it. Lainey was a fabulous heroine, strong when she had to be yet with moments of vulnerabilities. The sweet romance was a perfect choice for these two as Micah was a hero who came across as more sensitive than the average Alpha male. It was a wonder to see the world through his eyes and witness his thoughts and reactions to all his new discoveries. If you were a fan of the movie or television show Starman I believe you will highly enjoy this interesting intergalactic love story. Lainey spends her time alone writing. When she decides to use the town’s most notorious haunted house as a setting for her next book she never thought it would take her on such an adventure. The old house seems to call to her and when she discovers Micah, an alien from the planet Xanthia hiding there, she believes she has found a cure for her loneliness. Now they just have to avoid those who want to kidnap and expirement on Micah. He came from across the universe - a tawny, powerful stranger more perfect than any mere mortal. Yet when Micah crash-landed on earth, not even his boundless strength could help him resist the temptations of one stunning beauty. Trapped on a world not his own, tracked by enemies bent on destroying him, Micah fought to preserve his very life even as he ached to claim the love that would take him to heaven and beyond. Night Owl Reviews said ~ Amanda Ashley takes readers to another world with this fantasy romance. This story was originally published in 1997 so a few details when I was reading through me off but didn’t really stop the flow completely. My favorite part in this story was the fantastic relationship Lainey had with her parents. There was this deep and affectionate bond that shone through in all of their interactions and I loved how it also affected Micah when he was witness to it. Lainey was a fabulous heroine, strong when she had to be yet with moments of vulnerabilities. The sweet romance was a perfect choice for these two as Micah was a hero who came across as more sensitive than the average Alpha male. It was a wonder to see the world through his eyes and witness his thoughts and reactions to all his new discoveries. If you were a fan of the movie or television show Starman I believe you will highly enjoy this interesting intergalactic love story. Lainey stared at the old mansion, which sat alone at the end of an unpaved road. There had been rumors about the Grayson place for as long as she could remember. Some said it was haunted by the ghost of its last owner, some jokingly speculated that it was inhabited by a vampire. The townspeople might disagree about who or what lurked inside, Lainey mused, but they all agreed there was something definitely spooky about the place. The house had been vacant for at least ten years, and it showed. The paint was peeling off the eaves, some of the tiles on the roof were missing, several windows were cracked or broken. Trees and shrubs grew in jungle-like profusion. It was obvious no one lived in the house, and yet, lately, passersby had reported seeing a pale blue light flickering in the third floor window. Police had been sent to investigate, but reportedly had found nothing suspicious. It was a mystery, and Lainey loved a mystery. Reading them or writing them, it didn't matter. She'd take a good mystery over a love story any day of the week. Of course, if the mystery also contained a scorching romance, so much the better! She also had a fondness for vampires, werewolves, and witches, which seemed at odds with her deep and abiding fear of the dark. She also had a penchant for exploring old houses, but that, she decided, would have to wait for another day. Taking her camera out of its case, Lainey snapped a couple of pictures from varying angles. The mansion, which was said to be over a hundred years old, was the perfect backdrop for the murder mystery she was currently writing. From its gabled roof and small round windows to its enormous front door and shadowed veranda, it reeked of mystery and danger. She could easily imagine any number of foul deeds being committed within its dark interior. No doubt there were dozens of secret doors and passageways cut into the walls and closets, she mused, and if there weren't, well, it didn't matter. She would just write a few in. She zipped up her jacket as she glanced at the lowering sky.One more picture, and then she'd go. She was focusing on the round turret at the north side of the house when she saw a flash of movement in the third-story window. Startled, she lowered the camera and stared at the window, and then she laughed uneasily. There was no one there. She was just letting her over-active imagination get the best of her. Sternly, she reminded herself that the house had been vacant for years. Nevertheless, she decided she had taken enough pictures for one day. Slinging the camera strap over her shoulder, she started walking down the driveway to the street where she had left her car, walking faster and faster until she was running. Running as if she were being pursued by demons. Once she was inside the car, with the windows rolled up and the doors locked, she felt like a child running from shadows. But sometimes her wild imagination overcame her good sense. Shoving the key in the ignition, she gave it a twist. Grimacing, she tried again, and again, but the car, always temperamental, refused to start. Defeated, she rested her head against the back of the seat and closed her eyes. Perhaps she'd flooded the engine. The word flood had no more than crossed her mind when the heavens opened, unleashing a deluge that would have given Noah cause for alarm. "Oh, great," Lainey muttered. "Now what am I gonna do?" She sat there for twenty minutes before she tried to start the car again. Nothing happened. Maybe it was the battery. Jim, over at the garage, had told her she needed a new one. jumped out of her skin. Into her mind came visions of night stalkers and serial killers, all of them just looking for a lone female stranded on a deserted road. She glanced up at the house, wondering if she wouldn't feel safer, and warmer, inside four walls. Staring at the mansion, she felt her gaze drawn to the upper floor, felt a sudden, inexplicable urge to explore the house, to ferret out its secrets. Before she quite realized what she was doing, she was out of the car and running up the driveway. Breathless, she took the stairs two at a time, then stood shivering on the front porch. For a moment, she chewed on her lower lip, debating the wisdom of going inside, but another drumbeat of thunder decided for her. The door was locked, but one of the panes of glass was broken, making it easy to reach inside and unlock the door. The thought that she was committing a crime fluttered in the back of her mind. Breaking and entering. But she wasn't breaking, she rationalized, since the glass was already broken, just entering. Thoughts of drug dealers and other disreputable characters filled her mind as she opened the door. She could hear the blood pounding in her ears as she crossed the threshold. Closing the door behind her, Lainey stood in the entry way, listening. The sound of her footsteps echoed loudly as she crossed the black and white tiled floor to the parlor. Knowing it was useless, she flicked the light switch inside the arched doorway. Nothing. In the rapidly waning daylight, she could see a high-backed sofa and a couple of chairs crouched before a massive stone fireplace. Sheets that had once been white, but were now threadbare with age and thick with dust, covered the furniture. To her fanciful mind, the furniture looked like beasts of prey ready to pounce on unwary strangers. Standing with her arms folded over her chest, she stared at the fireplace, wishing she had the means to start a fire, when she felt a warm breeze caress her cheek, and the next thing she knew, there was a fire crackling in the raised hearth. Lainey blinked at the flames, certain she was imagining things. But there was nothing make believe about the heat radiating from the fireplace. She stood there for a long moment, wondering if the shivers running up and down her spine were caused by the fire's seemingly magical appearance, or her apprehension. For a moment, she considered going back outside to sit in the car, but the warmth of the fire was irresistible. Slipping out of her wet jacket, she spread it over the back of a chair to dry, then stood in front of the fire, toasting first her front and then her back. The warmth of the fire made her drowsy. Removing the sheet from one of the chairs, she shook off the dust, then sat down, the sheet spread across her lap, and stared at the dancing flames. How odd, she thought. Here she was, sitting in the dark in front of a fire that had started as if by magic, and she wasn't the least bit afraid. Listening to the sound of the rain as it splashed against the windows, she had the strangest feeling that she wasn't alone, that there was an unseen entity hovering nearby, watching her every move through curious, unblinking eyes, but even that didn't shatter the peculiar sense of well-being that was slowly engulfing her, wrapping her in a cocoon of contentment. Perhaps the place was haunted, she mused. But it didn't feel haunted. Enchanted, then. That would explain her sudden lethargy. But even the thought of being under some mystical spell lacked the power to frighten her as she drew the sheet up to her chin and closed her eyes.